I've always been a believer in the healing power of plants used for medicine and was pleasantly surprised when I found out that the Celts, like most ancient tribes, had their own ancient medicinal remedies. Unlike the popular image often bestowed upon the Celts as a primitive, unruly people, they were actually quite an advanced and industrious society, being traders in copper and tin and some of the first peoples to meld the two precious metals into bronze, a craft in which they became masters, and very wealthy ones at that! They were also a very holistic and spiritual people and I think the concept held of them by the majority today is an inaccurate and unfair one. This is due in large to Hollywood's often portraying them as a wild eyed bunch of bloodthirsty warrior types who rush into battle waving their primitive weapons with no idea of an actual battle plan or even an understanding of why or what they are fighting for. Their enemies in these films are often portrayed as more civilized and intelligent; however modern knowledge of the Celts has shown that they were far from uncultivated. The Celtics were a rural people by choice, preferring to live close to nature because of their love of the land and their view of themselves as being the caretakers of Mother Earth, and boasted many plants used for medicine in their herbal armories. The Druids were the spiritual guardians of the Celts and made sure that each Celtic citizen led a healthy holistic lifestyle. Exercise and proper diet were important as was a healthy spirituality, reflected in the many festivals of the Celts. the Celtics practiced animism, a religious belief that all things contained a spirit: the water, trees, rocks, the land itself, and for this reason showed extra care towards nature, lest they grieve a spirit. Trees in particular held a special place in Celtic religion, and they developed their alphabet around different trees. The Druids were also the shamans of the Celtics, the ancient "witchdoctors" and they used trees for medicine. On this page I'll discuss some of the plants used for medicine by the Celts. All are found in Ireland, and are also found throughout the rest of Europe in varying quantities and regions, especially of course in Britain and Wales. This page is for information purposes only. I am not a qualified physician or herbalist, and any herbal treatments should be conducted under the supervision of a qualified and liscenced herbalist or naturopath. Its easy to imagine the ancient Celts wondering through the forests or along the riverbanks and bogs of the south midlands of Ireland where Bilberry is abundant, gathering baskets of them to take back to their villages, munching handfuls of them as they delighted in their work. Places like Glenbarrow and the Slieve Bloom Mountains are excellent areas to experience this type of transportation back in time, where one can walk along nature trails and experience a glimpse of what life may have been like back then. Among the plants used for medicine by the Celts, Bilberry was probably one of the most beneficial and easiest to administer, as you merely have to chomp on a handful. Otherwise known as Huckleberries or Whortleberries, Bilberies contain powerful antioxidants, protecting the venial and arterial walls from being populated by dangerous fats, and protecting veins from other damage. They are also believed to strengthen the blood brain barrier, a membrane that separates the brain from the blood flowing around it. This prevents harmful substances thought to accelerate aging from reaching the brain and therefore helps to prevent debilitating diseases like Alzheimers. They are also very strong anti-cancer agents and contain anthocyanidins, a class of flavonoid, organic compounds widely distributed in higher plants; some are pigments and others have physiologic properties. These anthocyanins also protect our immune systems and have anti-histamine properties as well. Bilberries are also good for the skin, helping it to maintain its elasticity and tone. During the war, pilots ate bilberry jam before night missions to aid night vision. It’s easy to use Bilberry to implement Bilberries into your diet by simply eating a about a cup every day in a fruit salad, with your breakfast cereal, in a jam on toast, or as a delicious desert. If you don't have or can't get Bilberries in your area, don't worry, Blueberries make a great substitute and have similar properties and health giving benefits. The Celts revered Bilberry so much that they celebrated their ripening with the Festival of Lugnasa which took place on the Sunday closest to the first day of August, and the harvesting of the berries was part of the celebrations. In some parts of Ireland they still celebrate this festival as Fraochán Sunday. Considered an invasive weed by many gardeners, Burdock was held in high esteem by the Celts who used it as a medicine and a food, its roots being cooked as a vegetable or eaten raw. Unlike the gardeners of today, the Celts considered nothing as a weed and understood that every plant had its values and served a purpose. Burdock has been found to be an excellent detoxifying herb due to its ability to stimulate the body to eliminate toxins and is popular amongst plants used for medicine by herbalists today. It triggers all of the excretory systems, lungs, liver, kidneys, the sweat glands and the lymphatic and urinary systems to expunge toxins and excess fluids and so unblocking and detoxifying them. The Druid shaman may have given Burdock root to pubescent teenagers suffering from acne, as it has been shown that Burdock improves this condition as well as eczema and psoriasis and also helps to regulate the hormonal system due to its containing plant sterols, which also have powerful cholesterol-lowering properties. Burdock would also have been given to the elderly who suffered from arthritis, sciatica or gout. It is highly alkaline and anti-inflammatory and is used by herbalists today to treat these conditions. You can see why it would have been one of the major plants used for medicine by the Celts. Burdock grows just about anywhere due to its resilience, but prefers soil with high clay content. I have seen it growing near the South Lagoon at Sandymount Strand in the Clontarf Road area of Dublin. It's quite easy to use Burdock as a detoxifier, simply by making a tea of the roots, which are best harvested in July when they are at their peak medicinal value. The natural habitat for Nettle would be Woodland and Pond areas as it naturally needs fertile soil, abundant sunlight and moisture to thrive. It wasn't until man first began cutting down the forests for his building projects that nettle began to grow elsewhere. Being a hardy plant that has survived, according to archaeologists several Ice ages, the Nettle has followed man around, and as we all know will make its home just about anywhere and everywhere. Who among us hasn't felt the sting of the Nettle as a kid! What causes the stinging sensation of the Nettle is the penetration of our skin by the many needle-like hairs that cover the plant. This causes our immune system to releases histamine, a chemical found in some of the body's cells. The immune system mistakenly believes that this usually harmless substance is actually harmful to the body, and the histamine then acts on a person's eyes, nose, throat, lungs, skin, or gastrointestinal tract, causing allergy symptoms. But the Nettle is significant among plants used for medicine by the Celts in that it was probably one of the most widely used due to its ability to prevent hemorrhaging and stop bleeding from wounds. They would have used it to treat the wounds their warriors received in battle and also to help reduce excessive menstruation in the women. Nettle also contains fibres which the ancient Celts would have likely used to make cloth for their clothing. 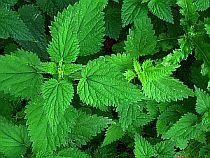 Nettle was used to make cloth by the Germans during World War II when cotton was in short supply. Recently it has been found that lectin found in Nettles is useful in treating Prostate enlargement and is widely prescribed for this in our times. Nettles also have a place in ancient Celtic folklore. Known as "Devil's Claw", Nettles were believed to indicate the living place of fairies, and their stings protected one from witchcraft or sorcery. Mistletoe was most likely imported to Ireland via the Greeks, who traded with the Celts and exchanged medical knowledge with them. Reference to Mistletoe is strewn throughout Greek Mythology, the goddess Athene used it as a curative and Aeneas took it with him to the underworld in order to assure his safe return to the world above. The Druids became great cultivators of Mistletoe, and can be found in Waterford today growing on old apple trees. The Celts had a special name for Mistletoe growing on apple trees, calling it silver bough, and it was considered sacred to the Celtic god Manannan, the sea god. It is now quite rare however, and can only be found in about a dozen places throughout Ireland today. The Druids used Mistletoe in their celebrations of the festival of Alban Arthuan, held during the Winter Solstice around December 21st. The Greek writer Pliny mentions the Druids cutting Mistletoe on the new moon at the end of the Celtic year (around December 21st) and using it to decorate the oak trees surrounding they area where they would partake of the ceremonial meal. They would later use these Mistletoe boughs in conjunction with the sacrifice of a bull to appease the Oak God Hu, who they believed would impart sexual vigor to them. Being hallucinogenic when consumed in large quantities, the Mistletoe berries were most likely used by the Druids in their rituals of prophesying and entering the "other worlds". Of all the plants used for medicine by the Celts, this was probably the most toxic. 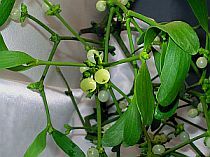 In recent times Mistletoe has been investigated for its possible treatment of various cancers, and a drug named Iscador was developed by Rudolph Steiner and a team of physicians, pharmacists and scientists in the 1920's. Since then a plethora of Mistletoe-based drugs have been patented by various companies with names such as Plenosol, Helixor and Isorel. Modern herbalists also use Mistletoe juice or tincture to treat cancer, however Mistletoe is extremely poisonous, and I reiterate, should only be taken under the supervision of a qualified and licensed herbalist. In April throughout Ireland beautiful fields of Dandelion can be seen growing in abundance. Dandelion is one of the most common wild plants found growing in Ireland, and around the world for that matter, and was another of the plants used for medicine by the ancient Celts. The ancient Celts celebrated February 1st as a festival to the White Goddess, whom Christianity later adopted and renamed St.Brigid, and one of her symbols was the Dandelion. The Celts would have used dandelion to treat fever such as malaria and jaundice as dandelion root stimulates the liver. This is supported by the 12th century medical text The Physicians of Myddfai and folk medicine records from County Meath in Ireland. They may also have made Dandelion coffee from its roots, which they did in Counties Cork and Kerry during the Emergency years of WWII, and which is common among naturalists today. Dandelion was later cultivated in medieval monasteries and was featured in the repertoire of plants used for medicine of the time. A tonic made from the sap and was taken at springtime as part of a rejuvenation and "spring cleaning" process. This would be in accord with the practices of the ancient Celts who were very much in tune with the cycles of nature. Dandelion is today used as a great detoxifier, blood cleanser and digestive aid. It strengthens the liver and aids it in breaking down toxins and it also stimulates the kidneys in order for the toxins to be eliminated rapidly. The flow of bile into the intestine stimulated by Dandelion enables better digestion and prevents the formation of gallstones. In the Turraun bogs of Co. Offaly lies the water-loving Willow, another of the plants used for medicine by the ancient Celts. The Willow was sacred to the Celts, representing the month from the 18th of March to the 15th of April on the Celtic calendar, and may have been used by the Celts to combat rheumatism, common in the dampness of the bog areas. Willow was also sacred to the Moon goddess Arduinna and the Druid god Beli. Acetyl salicylic acid, derived from the bark of the Willow, has perhaps been used by us all at one time or another. It is commonly known today as aspirin! The common mode of administering Willow bark for anti-inflammatory conditions by herbalists is in a tea, several grams of the bark being boiled in a pint of water and administered about 3 times per day. The Guelder Rose grows throughout Ireland; however a great place to see it is the area around Doon at Lough Carra, with sites from the late Bronze Age, where a spectacular nature trail will take you through a beautiful landscape of mountain, lake and woodland. The Guelder Rose bears little resemblance to an actual rose with its maple shaped leaves and lack of thorns. It puts forth clusters of red berries which ripen and turn purple in August. The Guelder Rose is another of the more poisonous plants used for medicine by the Celts, the berries being quite toxic. The bark of the Guelder Rose has been used for centuries by women for calming cramps, and was probably done so by Celtic females. It is still commonly prescribed for this by modern herbalists, though no official testing has yet been carried out. Due to its relaxing effect on muscles, it is also used to relieve hiccups and stomach cramps. It is usually administered in a decoction as a tea, taken in tablespoon size doses. The flowering of St. John's Wort would have coincided with the celebration of the Summer Solstice, and traditionally these plants are harvested during this time by herbalists today. It is during this period, June 21st - 24th, that the plant is considered to be at its peak and consequently most potent. I have seen St. John's Wort growing occasionally along the banks of the Royal Canal, in the Wicklow Mountains and along the cliff path during our walks from Bray to Greystones. This was one of the more mystical plants used for medicine by the Celts, being carried on one's person or hung outside the home in order to ward off evil influences and dark spirits. There are records of it being used by a notable early 20th century herbalist in County Waterford to dispel melancholia. We can see the correlation between this and the use of it in modern times for the treatment of depression. The oil of St. John's Wort is also useful in treating wounds, sores and ulcers and may have been used by the Druids for treating these ailments, as it has antiseptic, anti-inflammatory and astringent qualities which would help to both soothe the wound or sore and speed up the healing process. 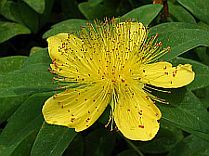 St. John's Wort can have adverse effects if mixed with some modern medical drugs, so again must be used under supervision. The Gaelic name for Comfrey means "the plant for broken bones", and is used as a poultice today for treating sprains, sprains, bruises and swellings. Until recently it was used by families in the Aran Islands, Kerry, Limerick and other parts of the country as a poultice for healing broken bones, knowledge which has probably been passed up through the generations from the ancient Celts. 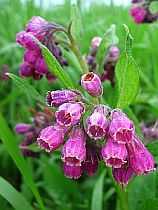 Comfrey can be found growing along the river at Shanganagh and near Loghlinstown, and in the past, in parts of Co Louth along the river Boyne. Due to their active lifestyle and the Druids being master botanists and herbalists, it would have been one of the plants used for medicine by the Celts. Comfrey is perennial; it grows year round, and would have been widely available to the Celtic physicians. Comfrey though is highly toxic, and not recommended for internal use. Even as a poultice one needs to be careful, as it does not have antiseptic properties and could infect an open wound. We will constantly be updating our section on plants used for medicine by the Celts as our research is continuous, so please subscribe to our RSS so that you may receive immediate notice when we update this page or any others on our website.